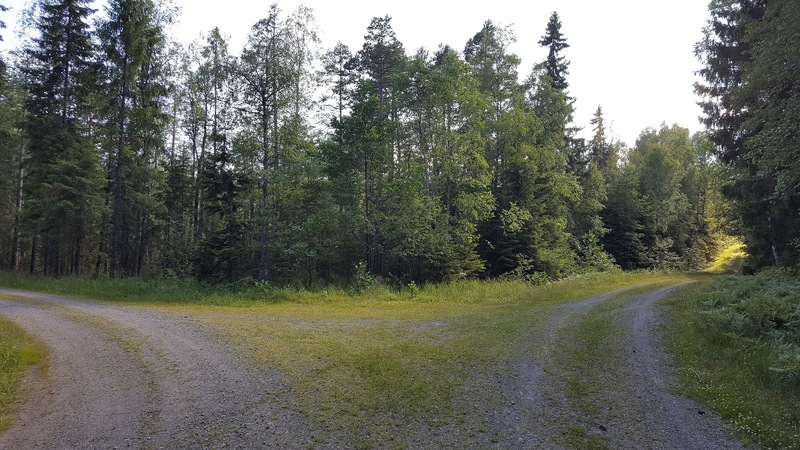 For those of you that intend on actually hiking in this area, if you have not read my guide to The Ed Loop, I suggest you do that first, as these two sections of hiking are directly related and connected to each other. 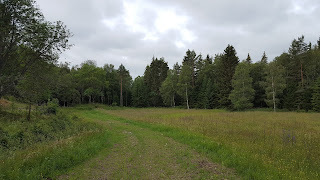 Plus, there is also more background information and context that I won't repeat here, so do check that out please. 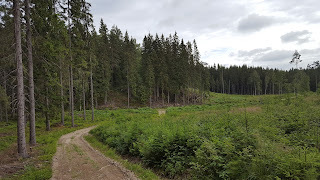 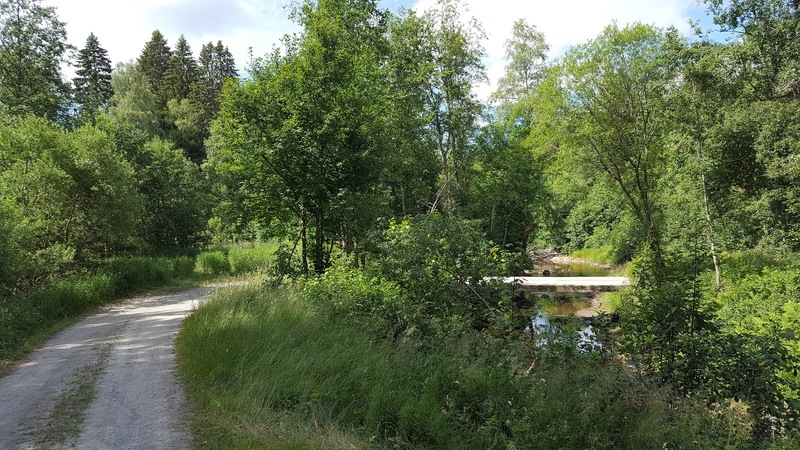 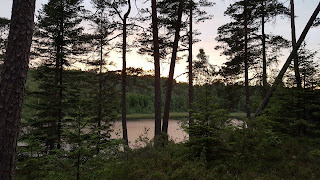 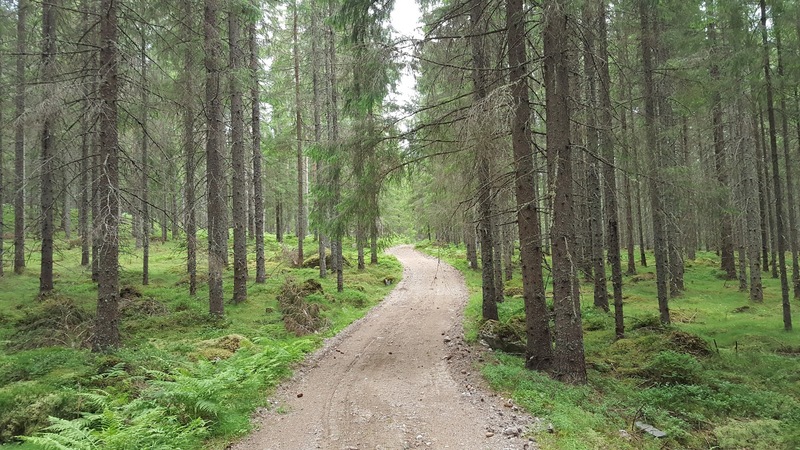 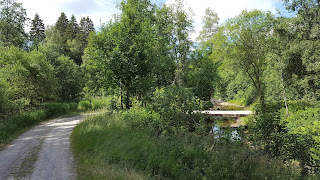 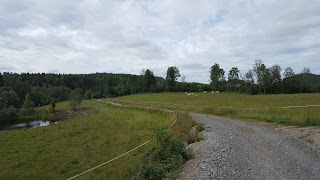 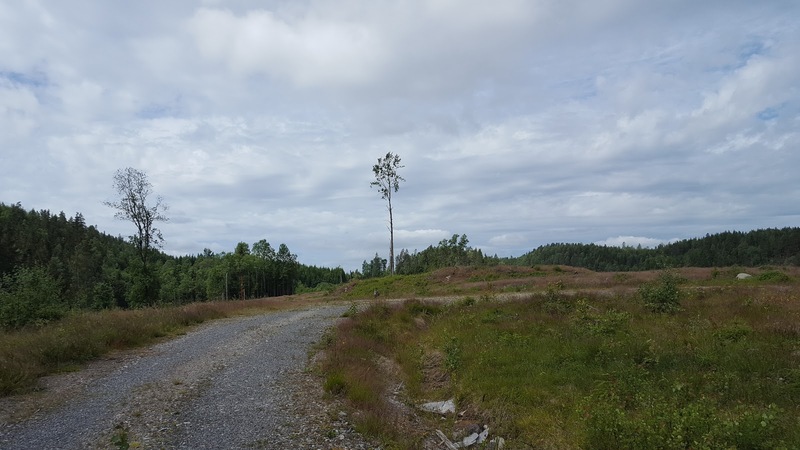 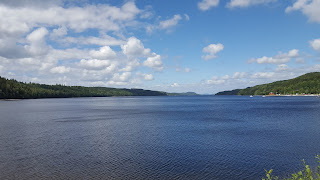 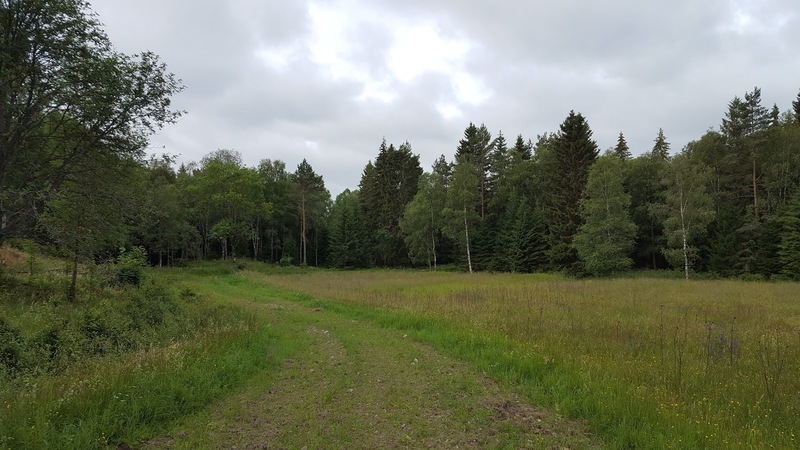 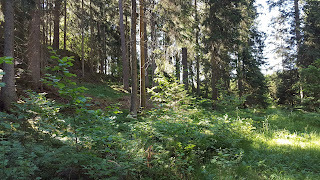 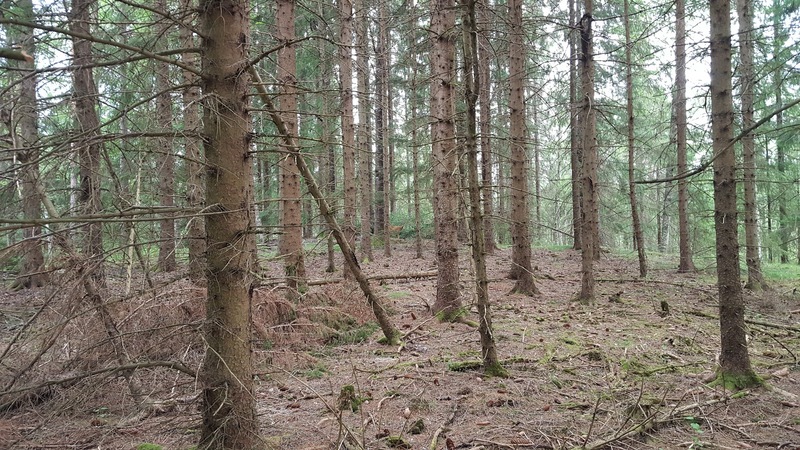 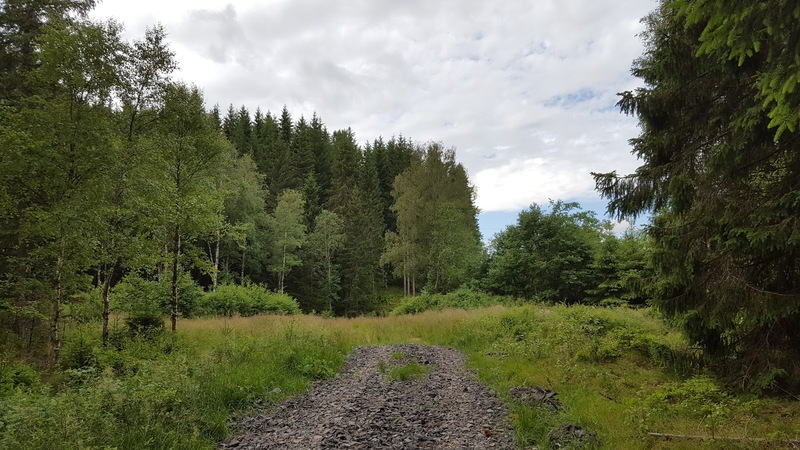 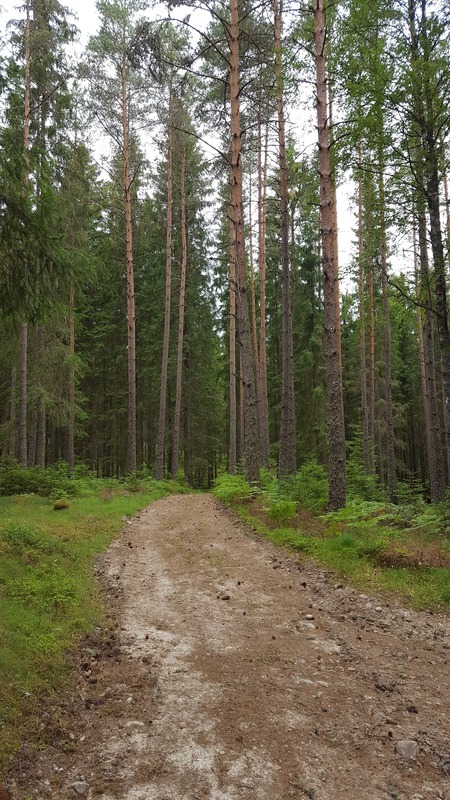 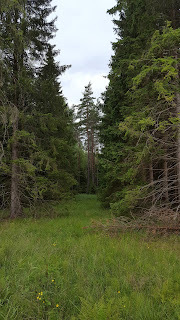 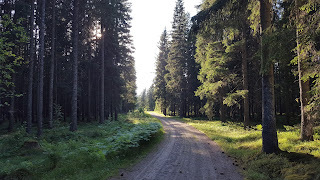 Together, The Ed Loop and The Dalsland Connection Route (DCR from now on) provide an alternative to hikers to connect two longer, well established trails: Bohusleden to the west, and Pilgrimsleden (Dalsland) to the east. 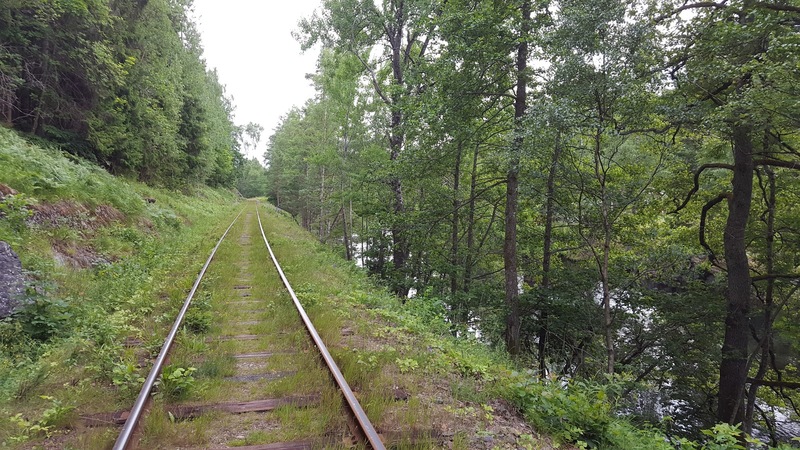 Or these new routes can also work as section hikes unto themselves. 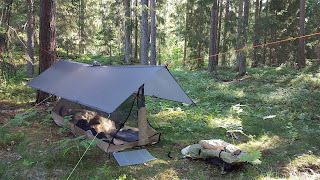 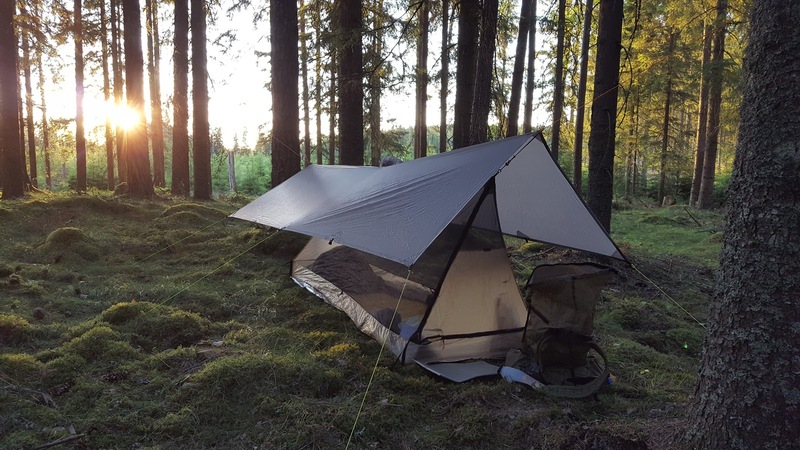 One potential shorter thru-hike that I really like the idea of is to start in Åmål in the east and hiking all the way to Strömstand in the west, or the other way around. 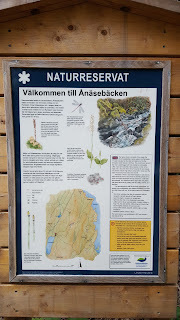 You can read my full trail guide to Bohusleden here. 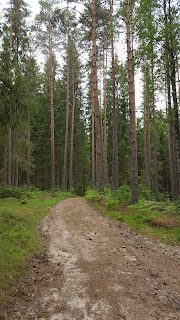 And you can also read a more recent partial trail guide to Pilgrimsleden here. 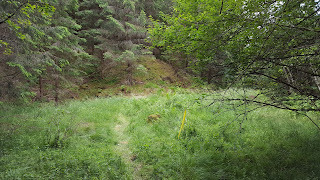 Plus here is a set of maps I put together that include this entire route. 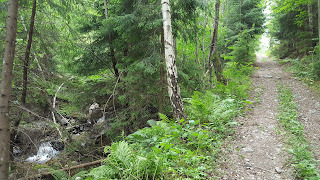 This route is a part of a larger trail system (and alternative E1) that I came up with called The Troll Trail, and you can read more about that here. 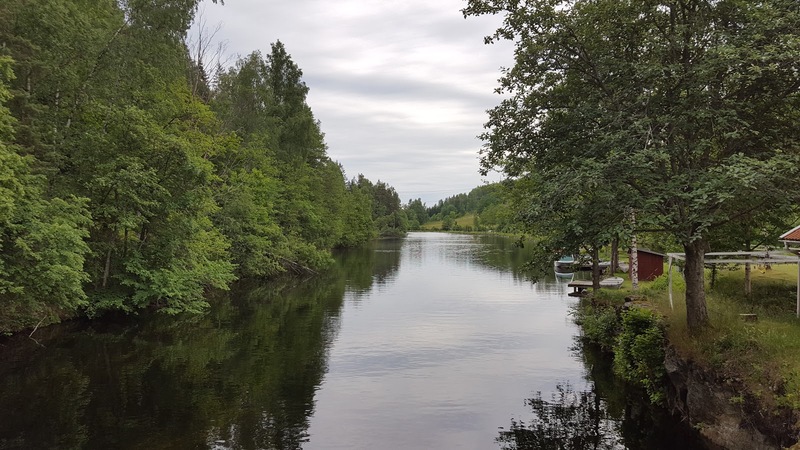 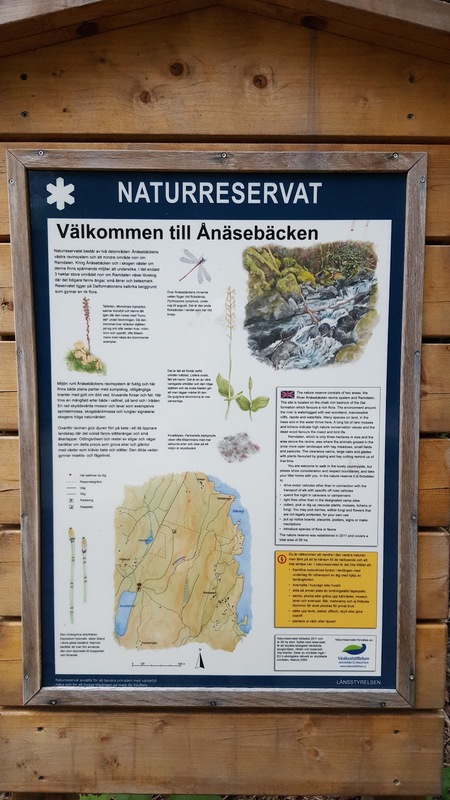 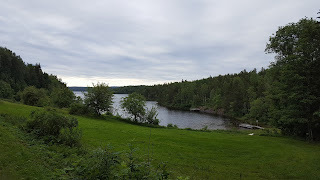 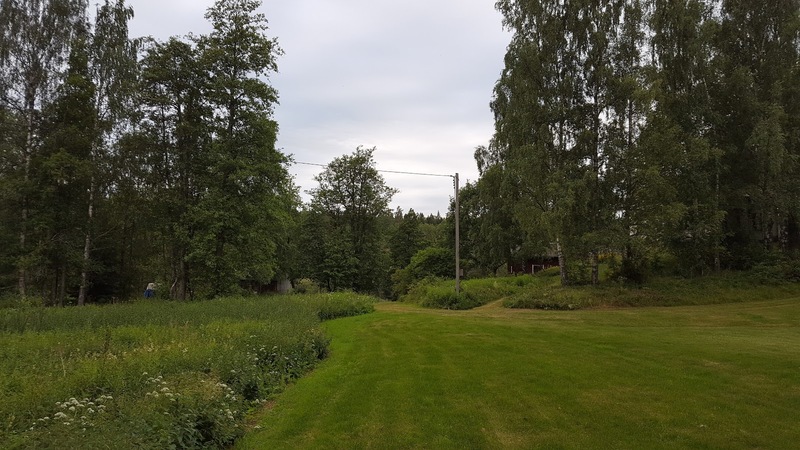 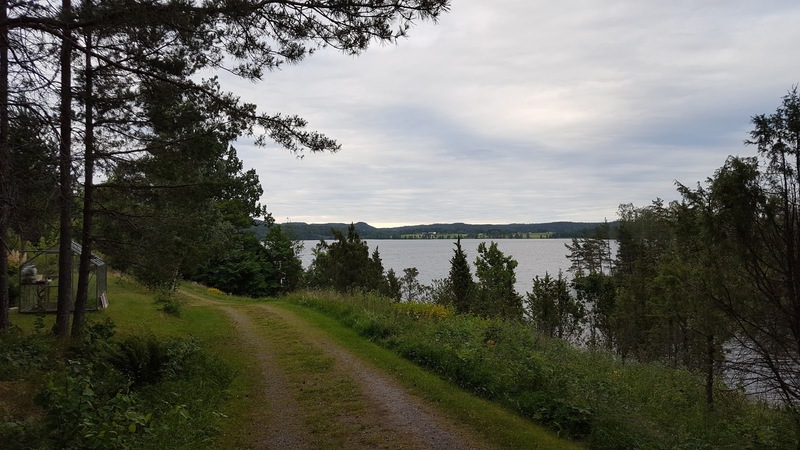 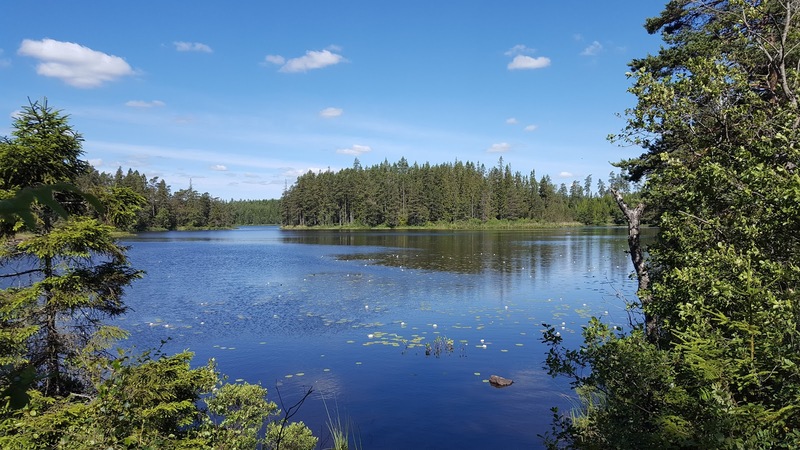 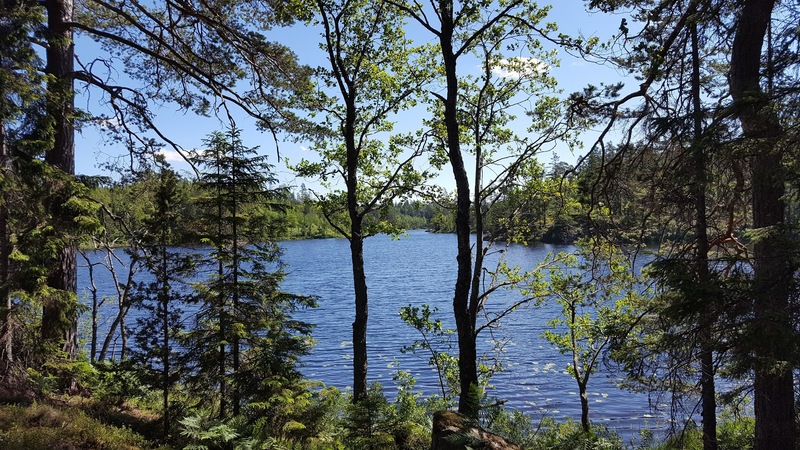 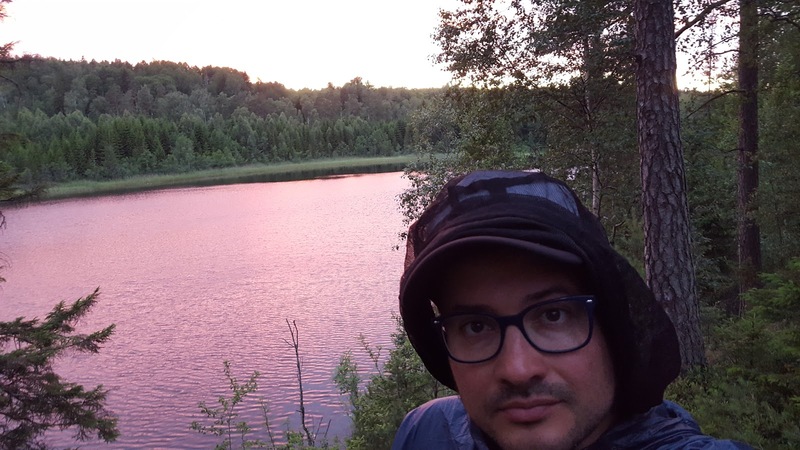 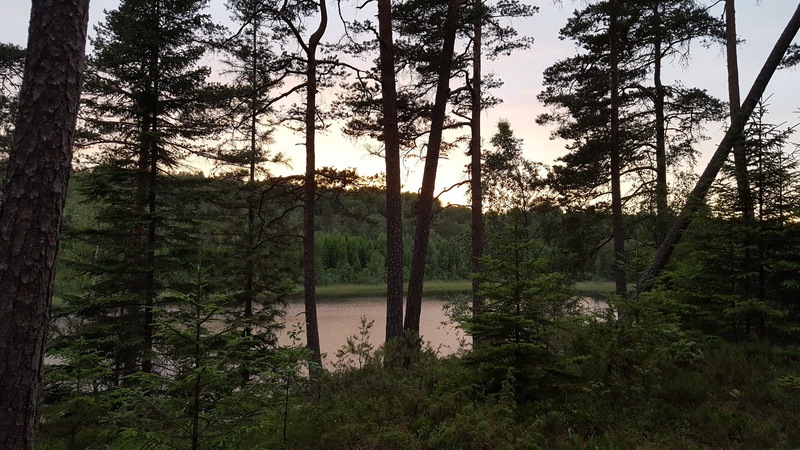 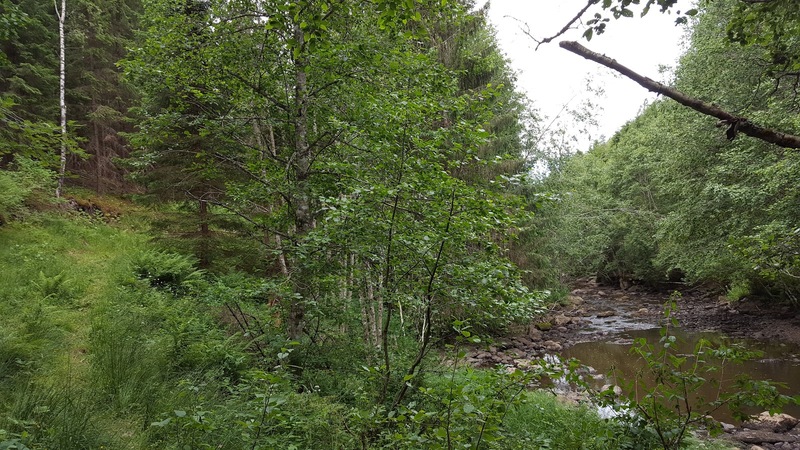 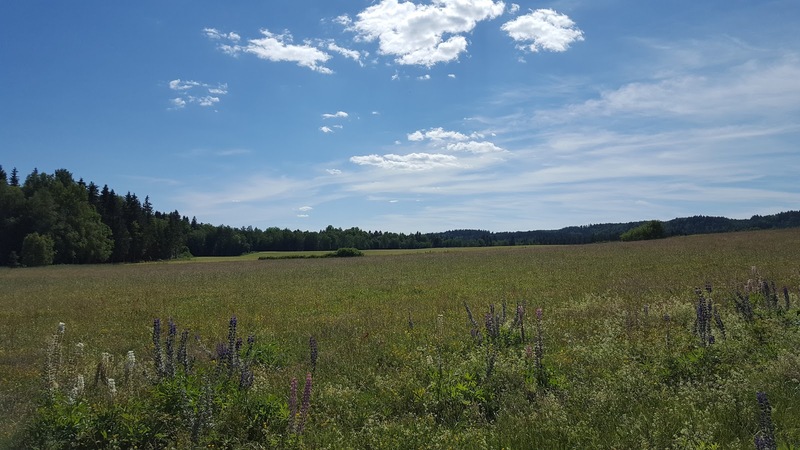 The DCR is around 50-60km (depending on how you choose to hike it), and runs from the town Ed in west, to the Dalsland Canal area to the east, centered around the villages of Håverud, Åsensbruk, and Upperud. 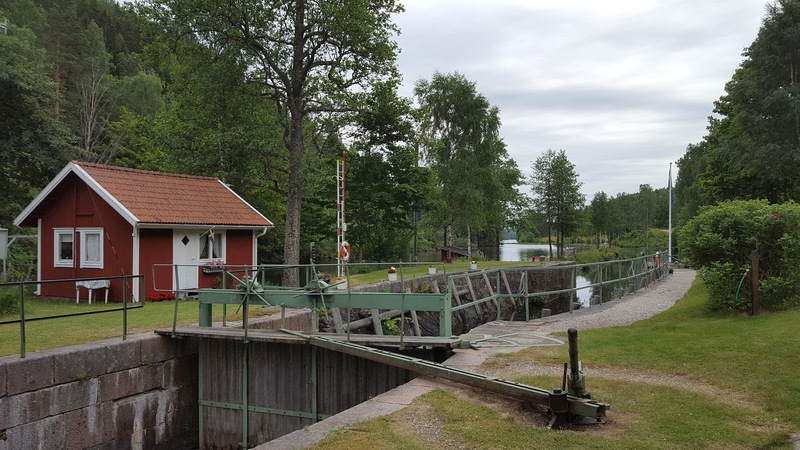 These three canal villages are all right next to each other and offer a variety of interesting things for hikers and travelers alike. One option already mentioned is Pilgrimsleden, which runs right through this canal area. 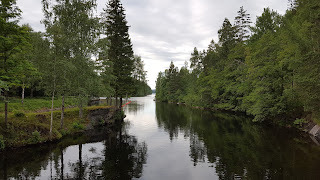 Another is that in the summer time, special boats and trains run up and down the Dalsland canal and beyond. 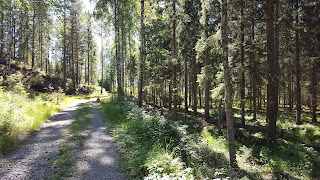 Then of course there are more mundane but practical amenities for hikers/travelers, such as access to regular public transportation, restaurants, cafes, B&Bs, supermarkets, etc. 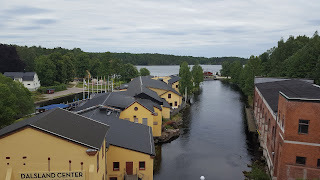 From these canal villages, one can catch a bus or train to the larger town of Mellerud, where there are further connections. Or backpackers can simply continue hiking onto Pilgrimsleden, which is accessible at several points in this area. 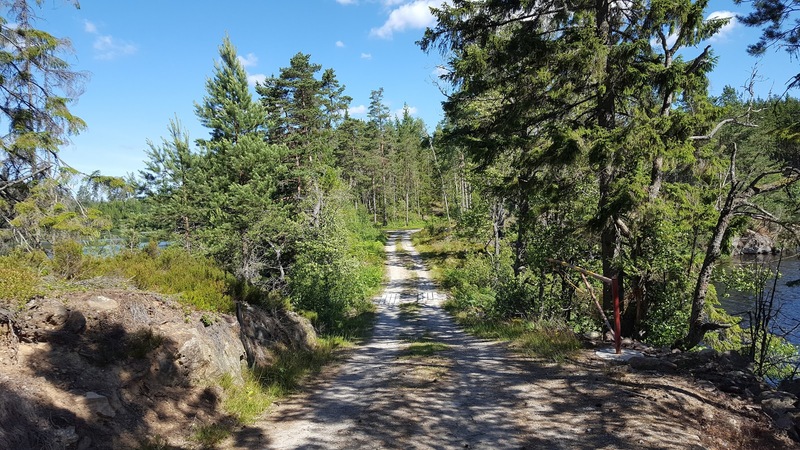 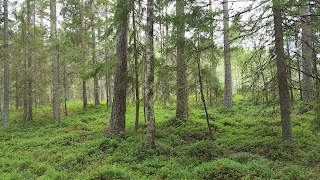 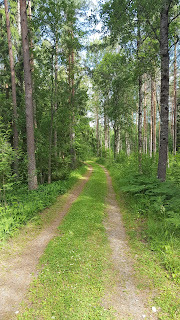 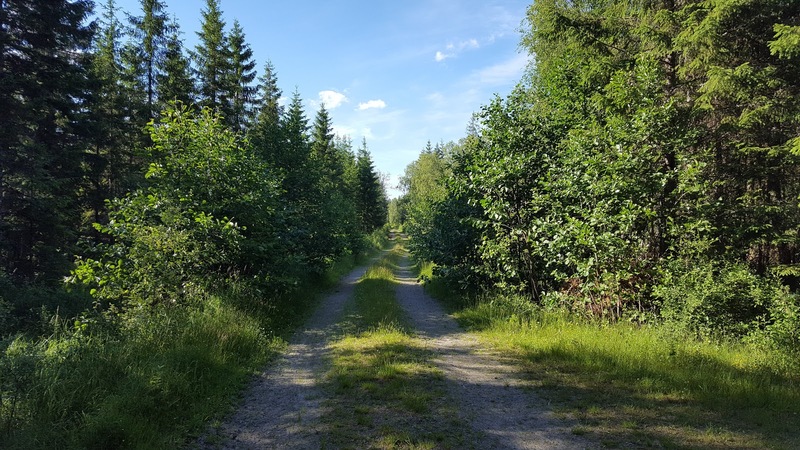 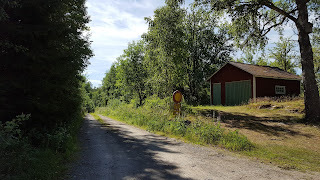 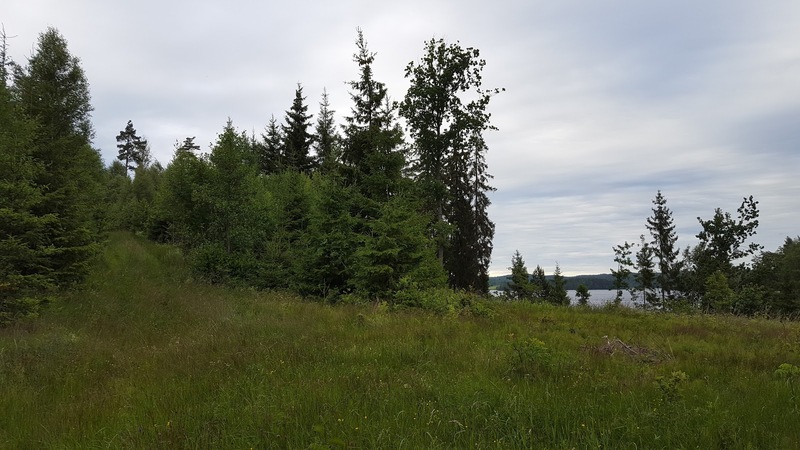 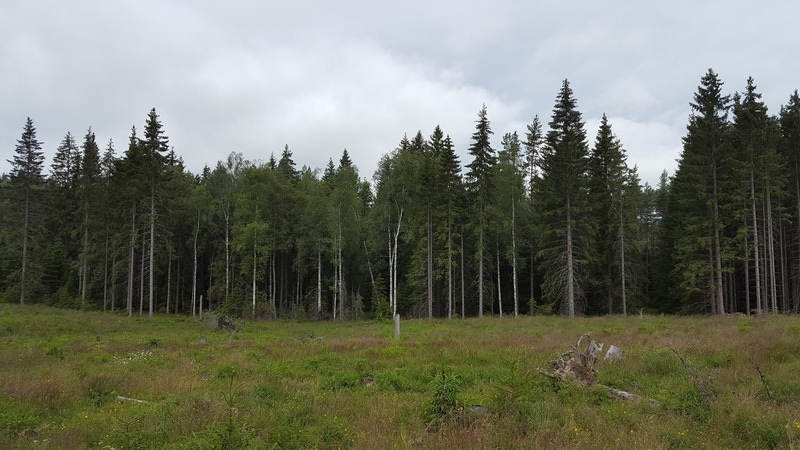 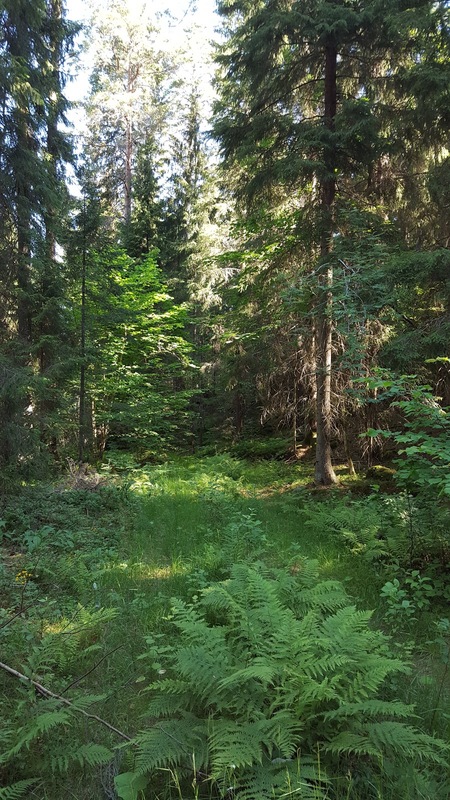 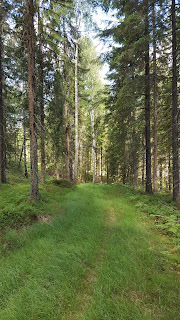 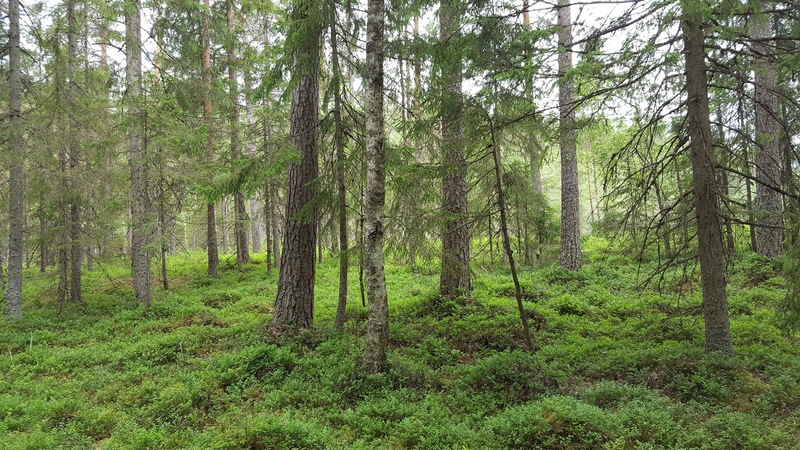 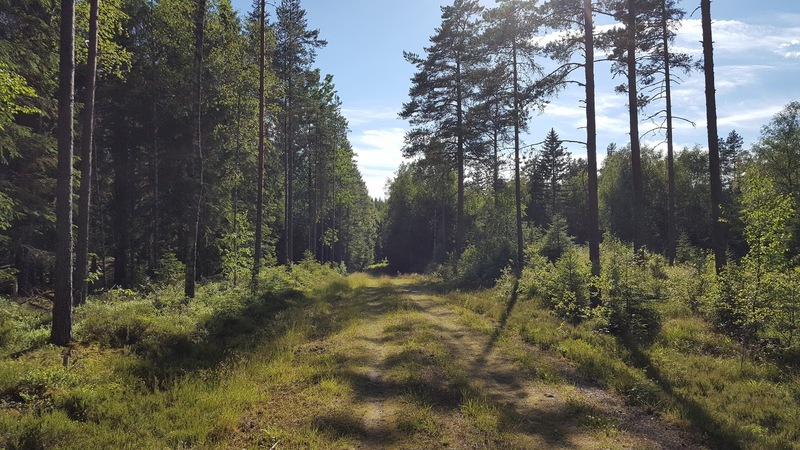 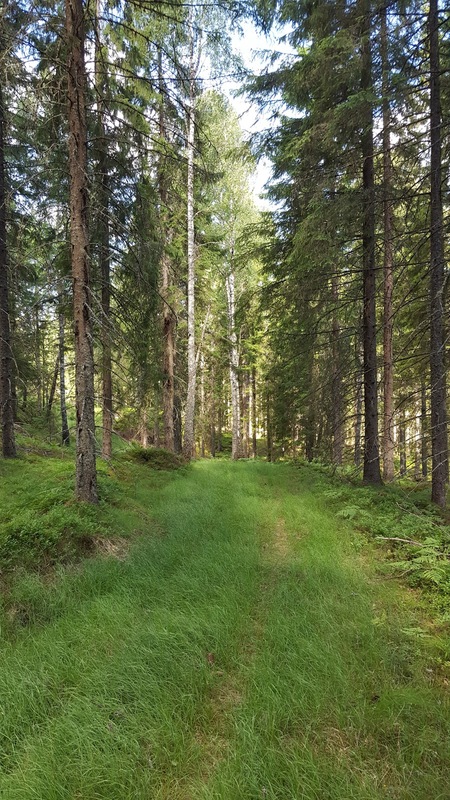 The trail passes right through Upperud, and there are a few roads and trails one can follow from Håverud that intersect with the trail only 2-3kms away. However if one is hiking on Pilgrimsleden and wants to jump off this trail to hike west on the DCR, there are generally two ways to go about this. 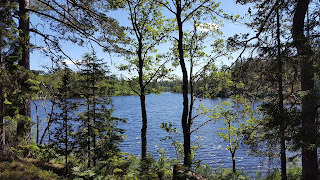 One is to hike around the south end of the big, narrow lake Åklång, which is right next to Håverud and Åsenbruk. The other way--which is the path that I chose to take--is to either hike or take the local summer train a few more kilometers north to the hamlet and nature reserve of the same name, Buterud. 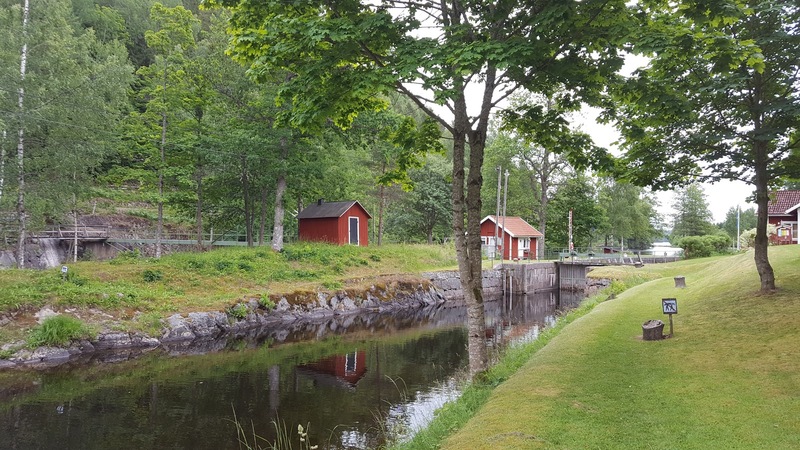 I was lucky enough to catch the train--completely by chance, as I didn't know it existed until this trip!--to this charmingly little place that sits on both sides of the Dalsland canal. 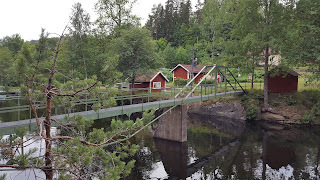 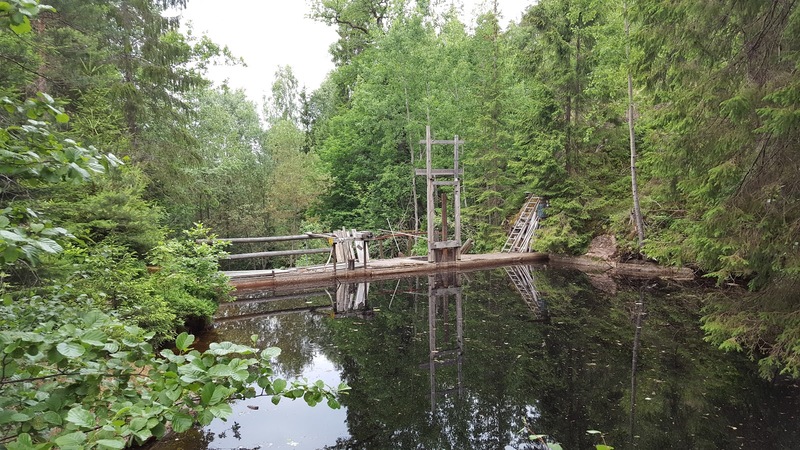 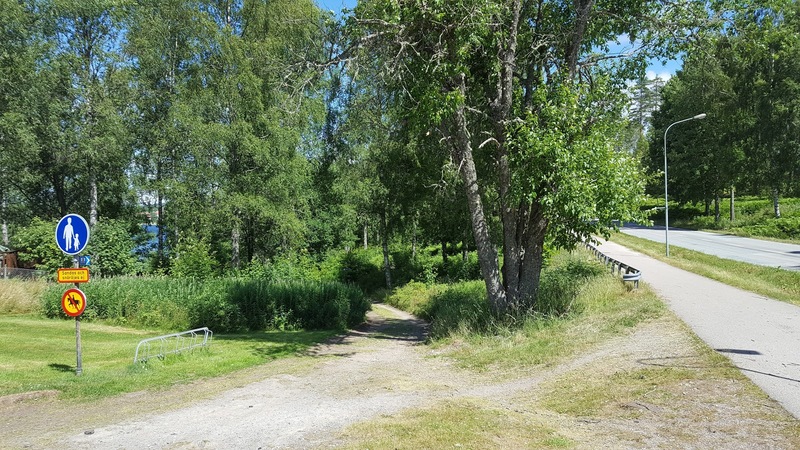 What is also key to this place is that there is a footbridge (see: below) that crosses over the canal, and this bridge is a mere 4km walk directly from Pilgrimsleden (leaving the trail close to lake Livarebosjön) or a 5km walk from Upperud. Note that it is generally safe and acceptable to hike on the train tracks in this area, and you will need to do this to one extent or another to get to the footbridge over the canal anyhow. 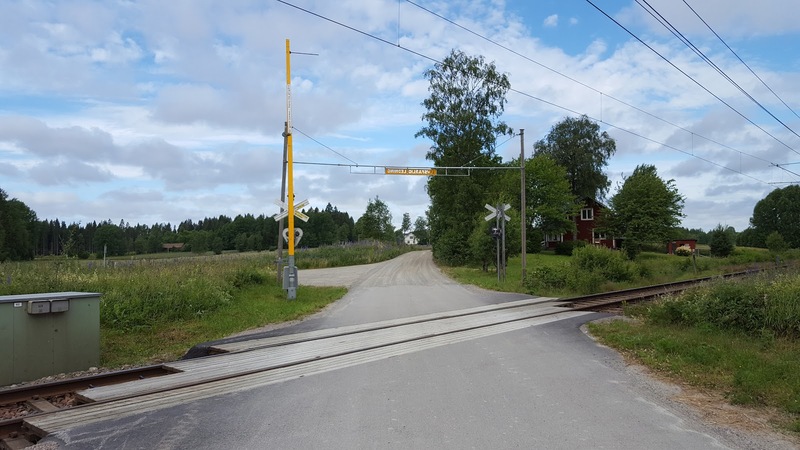 I spoke to a very friendly local in Buterud who assured me this was okay, and that locals do it all the time. 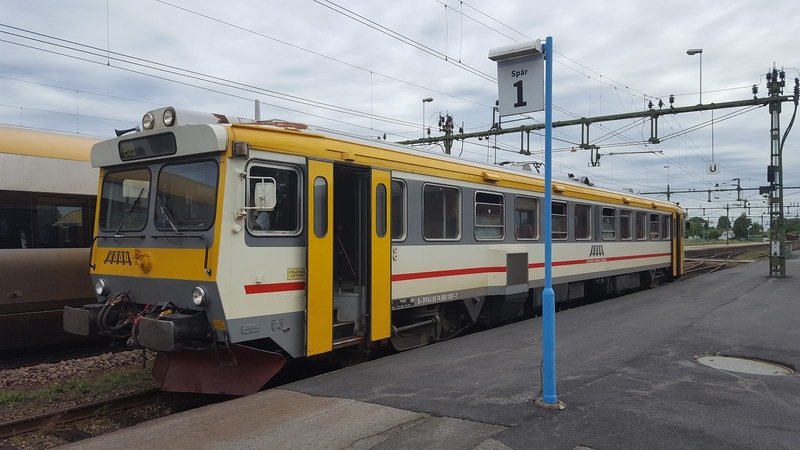 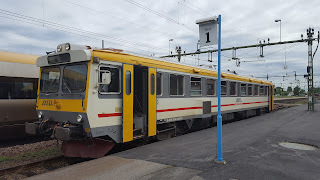 The train is not a modern, fast type train, but one of those smaller, old school type trains (see: below), and goes at a slower pace than regular trains. 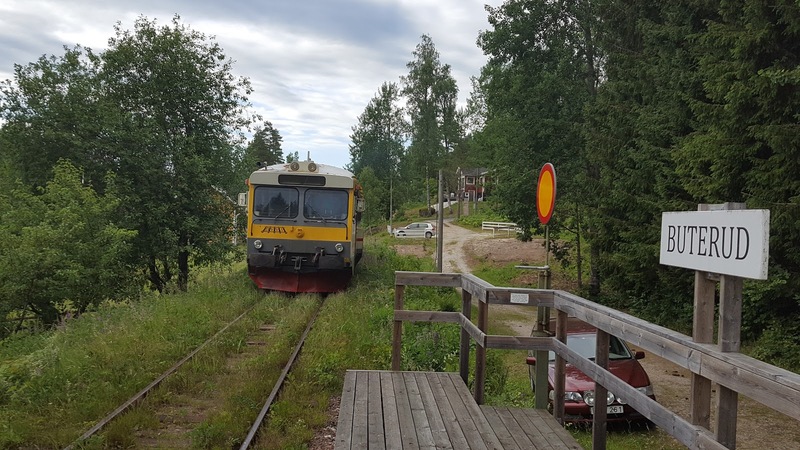 Plus, the local told me, the conductors are good at tooting their whistle at people on the tracks so they can move aside. 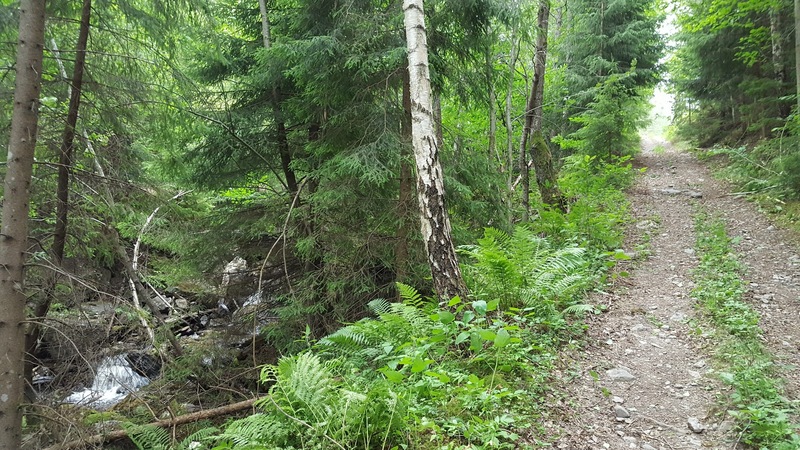 Please note that this route, The DCR, is not a marked trail. 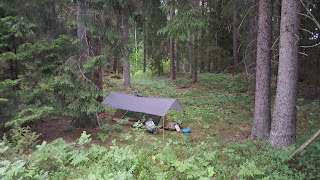 There are no trail shelters, though there are plenty of nice spots in the woods to make camp, and lots of good water sources. 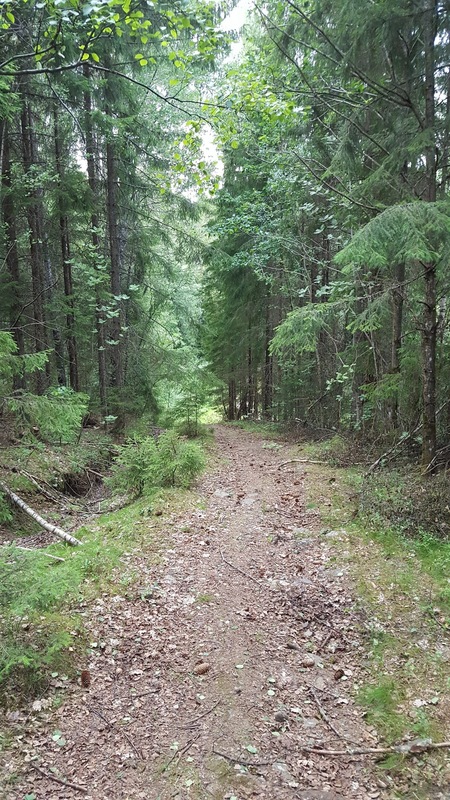 This is a path that I came up with to connect with another route (that I also came up with) mentioned previously, The Ed Loop. 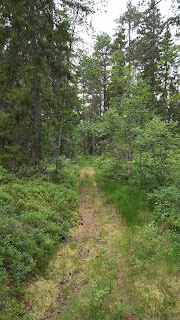 As such, this path is not one I would recommend to inexperienced backpackers. You will need good maps of the areas, a compass, and good orientation skills to hike this route. 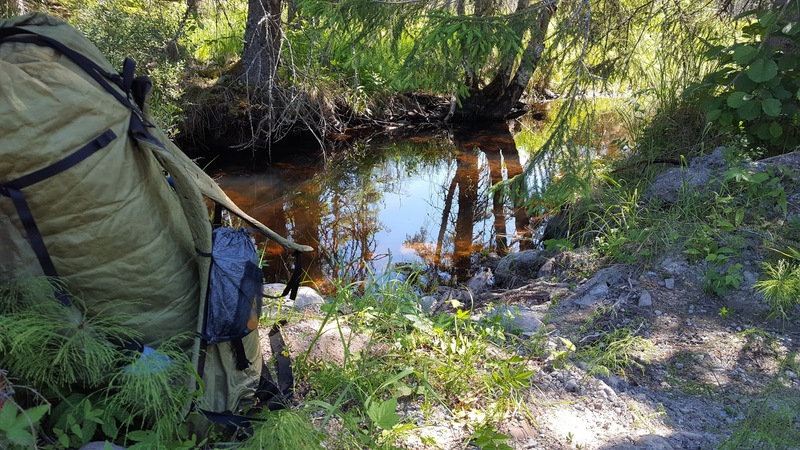 And as my guide will soon point out in detail, there are several challenges in navigating this path, though nothing insurmountable for a backpacker with some solid experience under their belt. 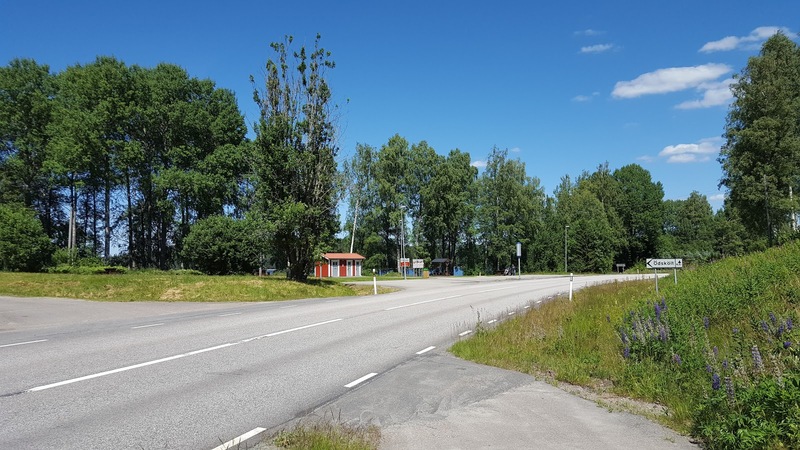 But if you're not up for it for whatever reason, and you're in Ed and just want to get to Pilgrimsleden, no worries--just take a bus to Mellerud. 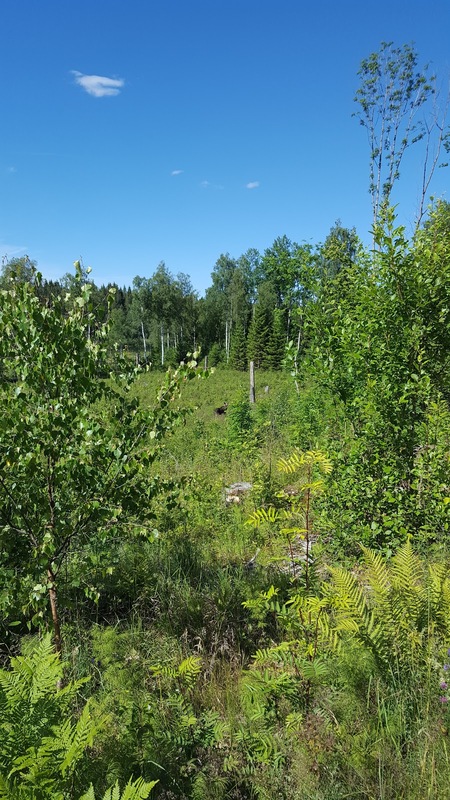 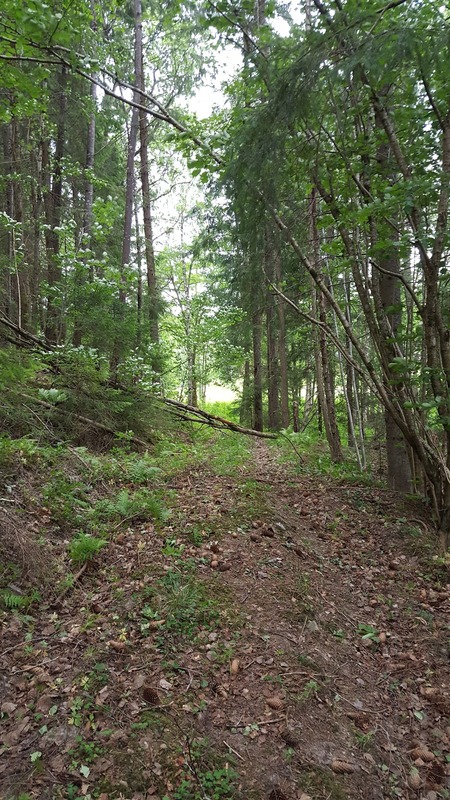 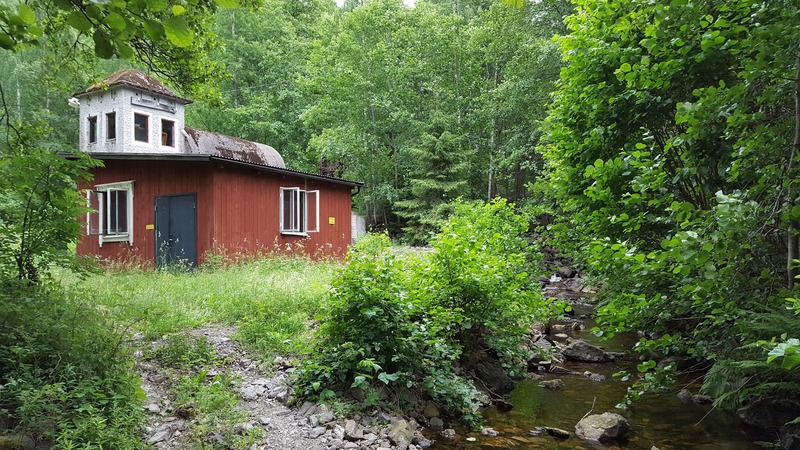 On the DCR you will be hiking through fairly isolated terrain on various lumber roads, backwoods dirt roads, unmarked trails, even faint animal trails and outright bushwhacking. 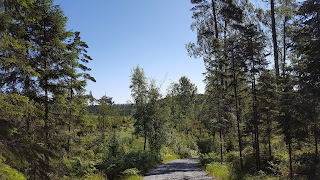 To further complicate things (for the time being, at least), some of the roads and trails this route follows or passes by are not even marked on any map that I am aware of. 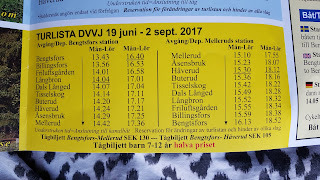 And I studied several maps thoroughly and brought along two separate maps of roughly the same area, and both of which were the most current maps available. Finally, before we get to the trip report itself, I would add that I worked very hard in planning this route to limit the amount of time spent hiking on asphalt. 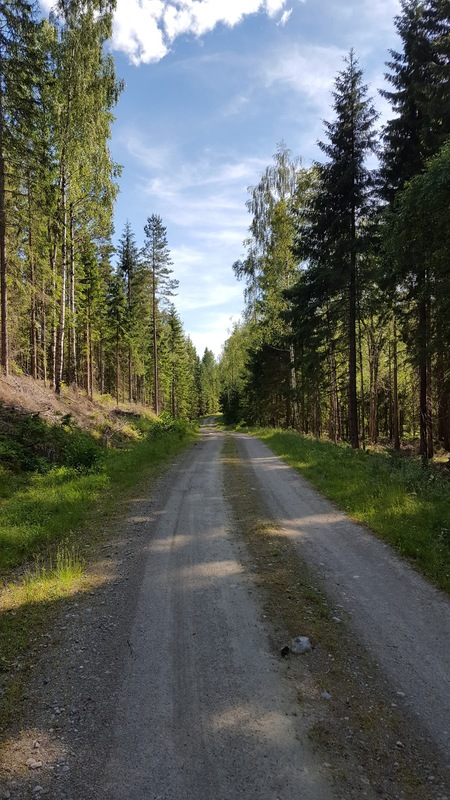 There is a fair amount of walking on dirt and gravel roads, but most of them go deep into the forest and are more wild and woodsy. 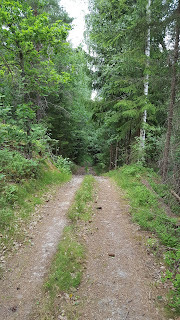 A large portion of these roads were overgrown with grass and moss, and felt more like hiking on a trail than a road. 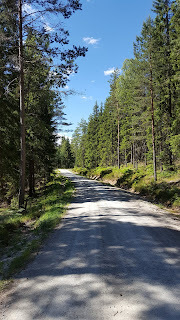 In total there is only a maximum of about 7-8km of asphalt from Upperud to Ed, though from Buterud to Ed following a slightly less direct route into the town of Ed (which is what I did, more on this soon), you can limit this down to 4-5km. 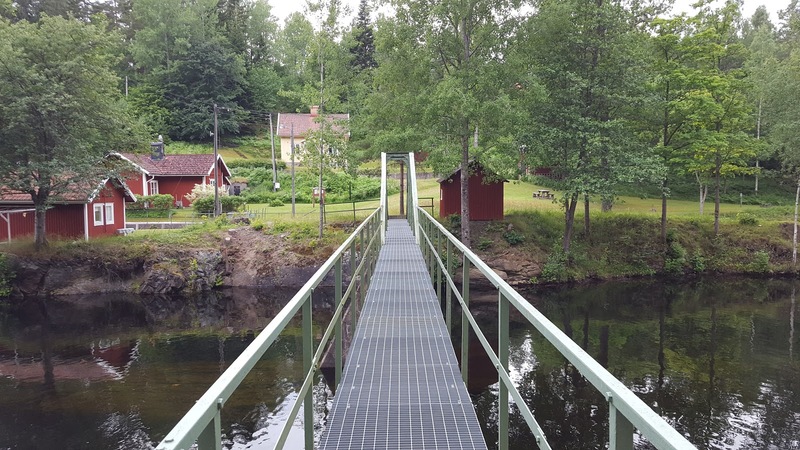 The report that follows goes from east to west, starting just past the footbridge in Buterud and ending in Ed. The train up to Buterud I highly recommend, if you can catch it. 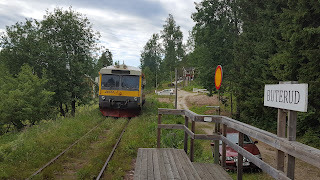 It runs twice a day only, but as stated before, only in the summer. 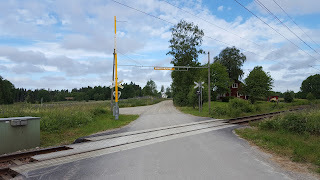 But if you can't catch the train, this place is easy enough to find and is close to Pilgrimsleden. Past the bridge and the water lock there is a water tap, an outhouse, a trash can, and a picnic bench. There is a gravel road that goes north, past the canal, and to the big lake Råvarp. When you get to a small and old looking dam that flows into the big lake, follow the overgrown path down to a run down building that is the end point of a large pipe of water that I guess regulates the flow of water into the lake. 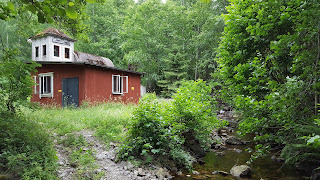 Close to this building to the west is an old and even more overgrown trail that takes you to the large yard of a house on a small bay. 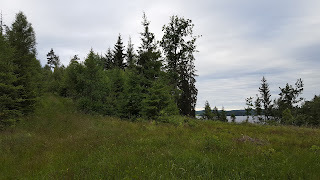 Continuing west, a faint trail loops around the southern nub of the small bay of the lake. 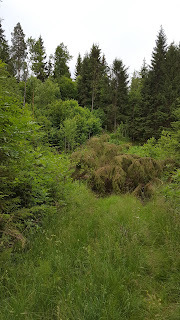 The trail was blocked by a fallen tree and overgrown brush, but I was able to slog around and find it again and head northwest. All this made for quite a pleasant hike, and it was an encouraging start to this first hike of the DCR. 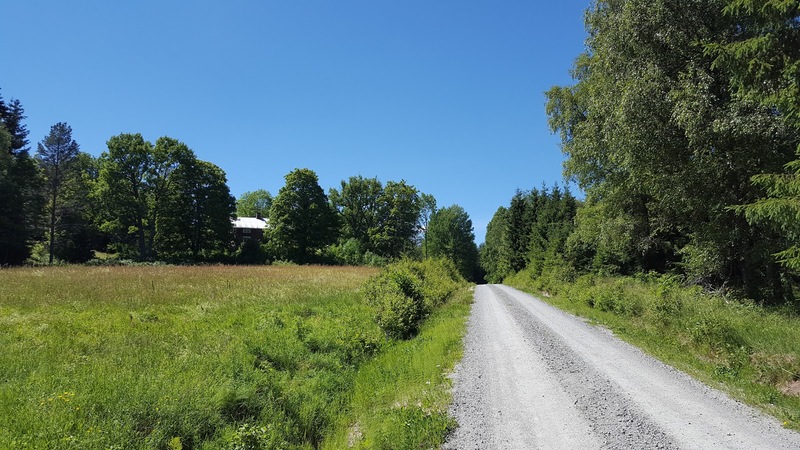 Soon on the western side of Råvarp the unmarked trail intersects with a gravel road with a handful of small farms and summer homes. 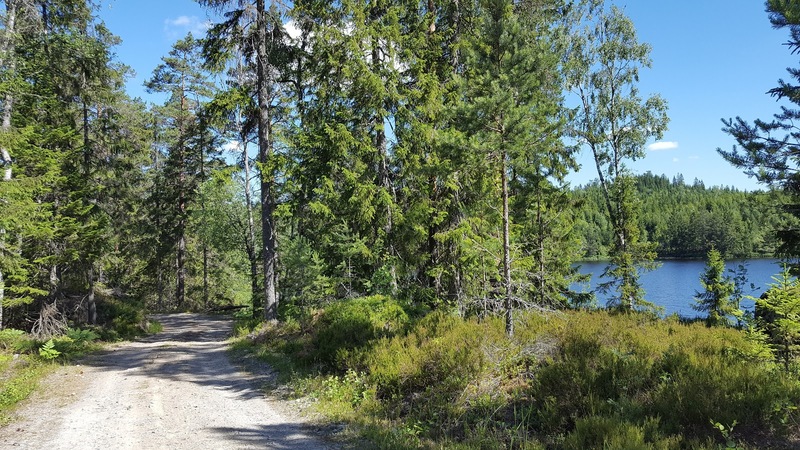 After a few kilometers, there is a small lake called Ånäsetjärnet, where there is some nice if not faint woodland trails to explore on either side of gravel road. 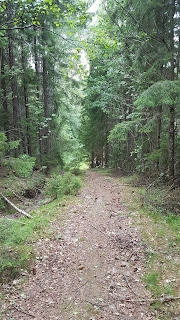 South off the road a trail follows a cliff close to the lake, while north off the road there is a small nature reserve. 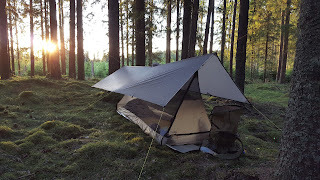 I decided to explore the trail near the lake to make camp for the night, and it was quite a lovely place to spend the night. 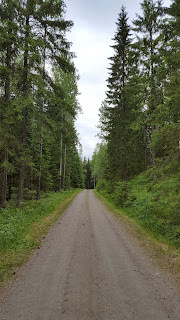 The next day I continued with a short (1km) hike south on the paved road that intersects with the gravel road near the lake. There is a gravel road that heads west off this paved road, and again I was pleasantly surprised to find that the road eventually transforms into a woodland path for a bit (behind a small farm) before reverting back into a gravel road. 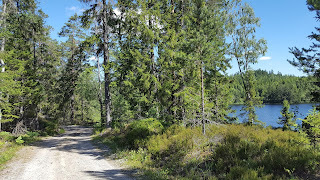 The gravel road crosses between two lakes, Nedre Högsjön and Övre Högsjön. 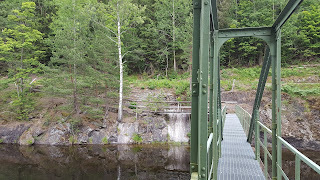 This place was scenic and peaceful, so I sat on the bridge in between the lakes, ate lunch, and watched fish swim around and under the bridge. The gravel road soon intersects with a dirt road at the northern end of Övre Högsjön, where I went turned left and continued to the west. 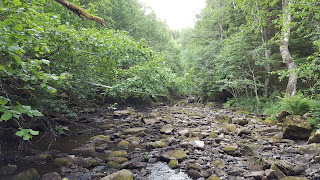 On this dirt road there are a few streams that you pass by and you can take a water break. 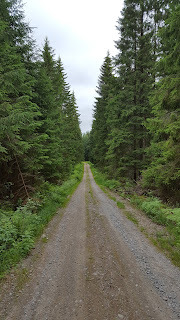 This road is pretty straight forward, and you can hike fast here while enjoying the thick forest all around you. 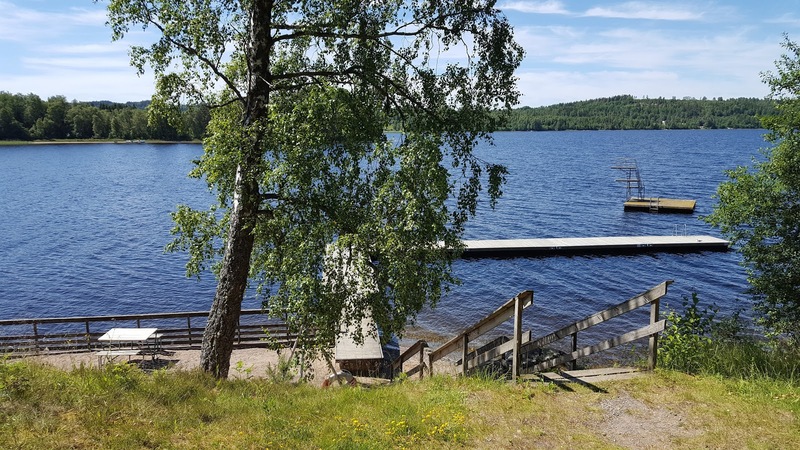 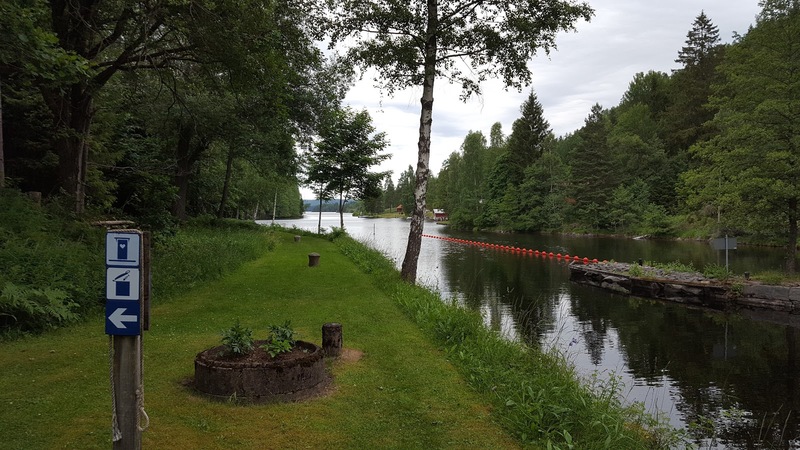 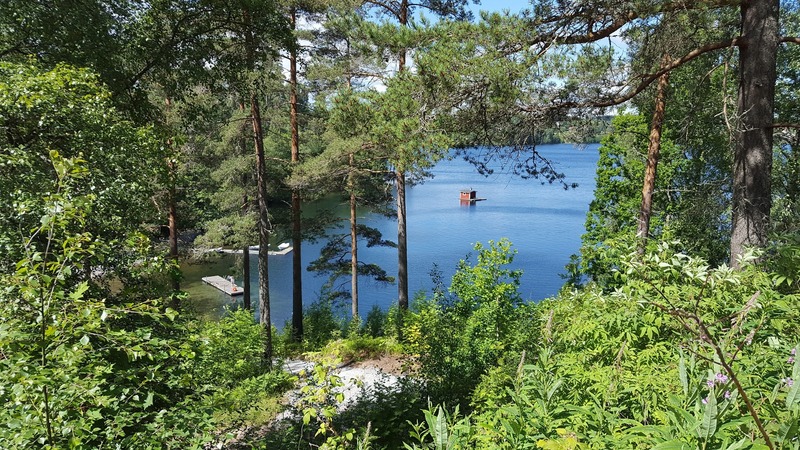 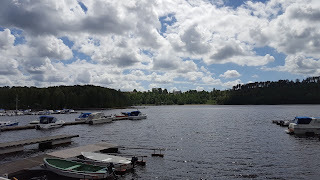 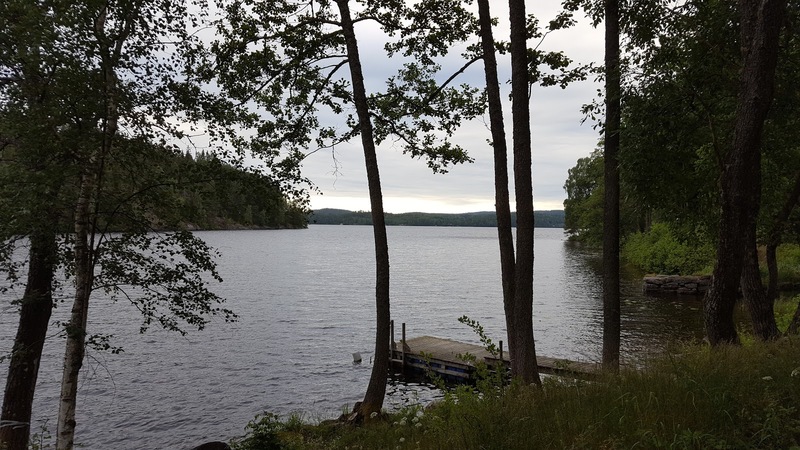 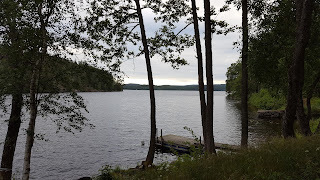 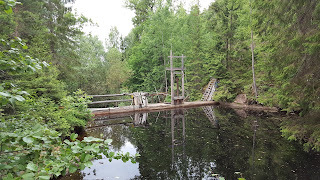 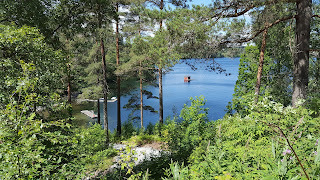 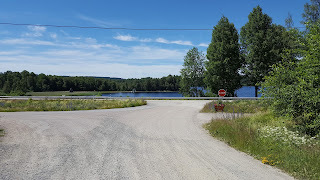 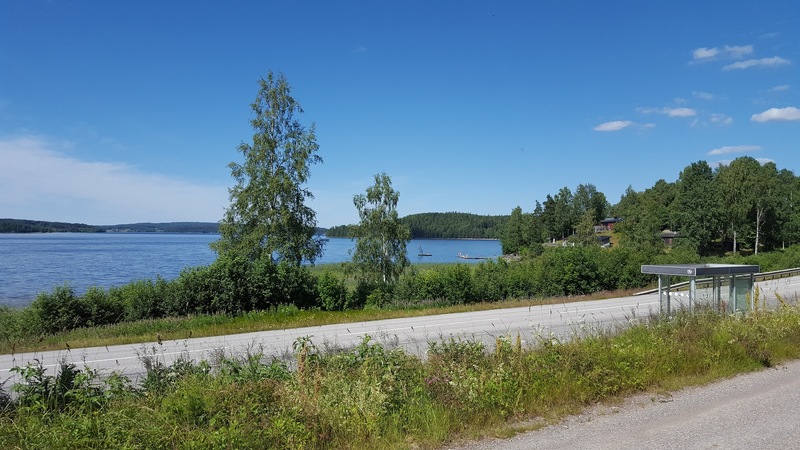 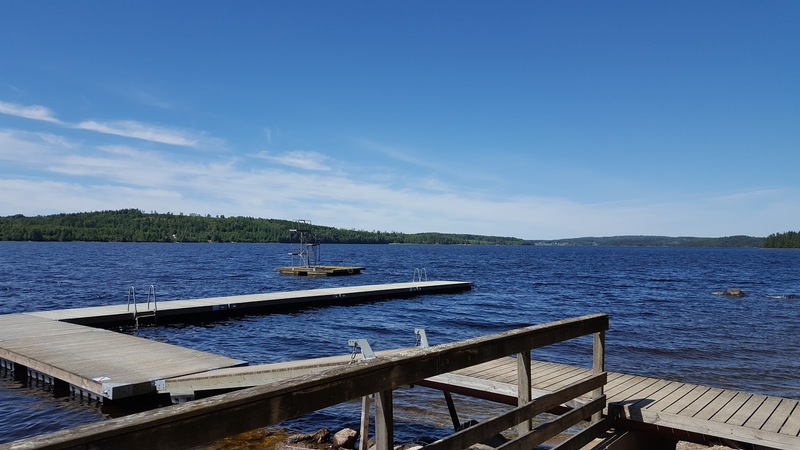 I was also excited about taking a break at the end of this dirt road, where it connects to a highway near the huge lake Iväg, and close to this intersection is a rest area and swimming spot, complete with a boardwalk and floating diving boards. 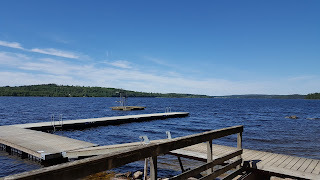 I highly recommend swimming here! 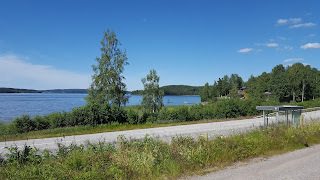 I had a great swim and long break there at the southern end of Iväg, knowing I still had a fair bit to go before calling it a day. There are also toilets and trash cans at the rest stop, and I also noticed a bus stop nearby. 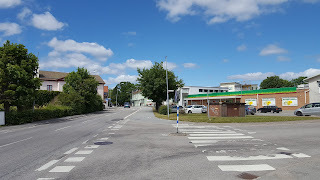 You can catch a bus here that can get you to either Ed or Mellerud. 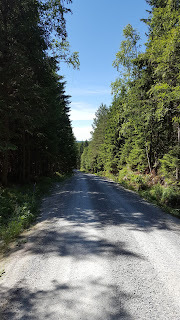 Now here there are a few kilometers of asphalt that you'll have to put up with, but it's short, and actually the scenery is not bad. Plus soon enough you'll be deep in the woods again. 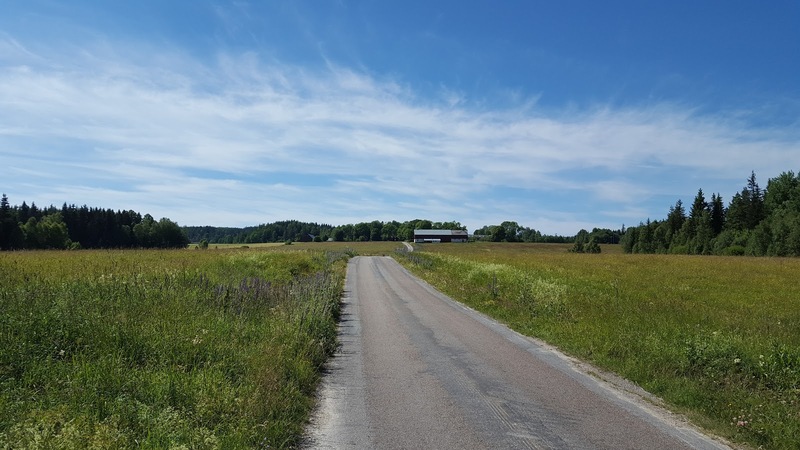 Simply continue west, crossing highway 172, through some farmland, to the hamlet of Kroken, where the road ends at an intersection. At this intersection, I turned right heading north, and then soon after (<1km) turned left and headed west again. 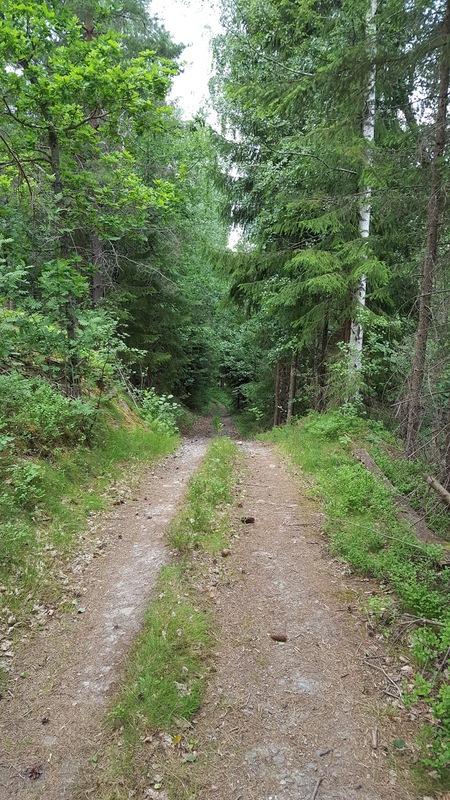 Now here is where things can get a bit tricky, on this old, unnamed lumber road. 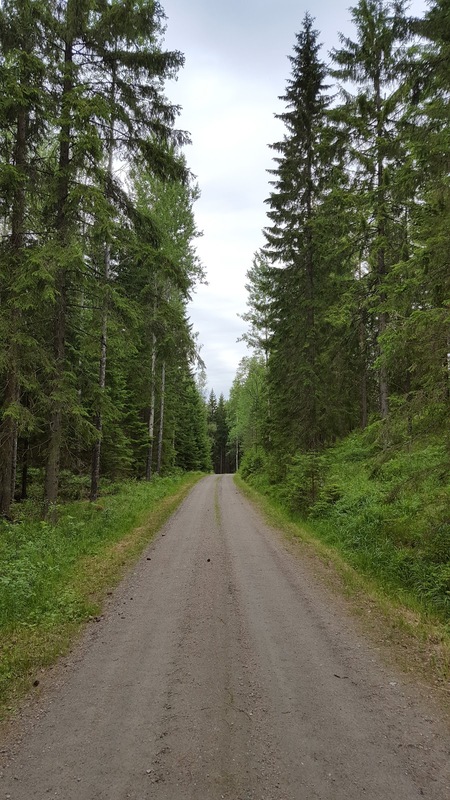 The road begins as gravel, but further along the road it becomes more grassy and overgrown. 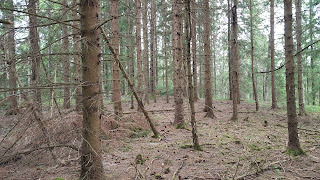 This is also one area that does not currently match the maps, as I discussed above. There were several trails and other, smaller lumber roads that intersected with this road that aren't on the maps, and to make matters more difficult, this road also turns and weaves through the woods quite a lot as well. There is also a lack of any major landmarks in this area, like lakes or houses or power lines, etc. 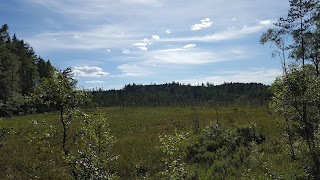 It's pretty much just thick woods and a few patches of bog. 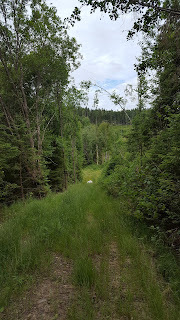 I came to a fork in the road that I thought may perhaps be a shortcut to the next dirt road to the west that I wanted to continue my hike on, so I took a small gamble and decided to check it out. 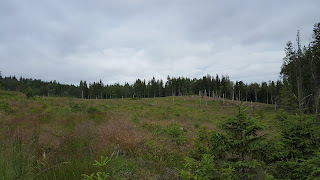 Unfortunately it ended in a big patch of clear-cut woodland, no trails or roads anywhere in sight . 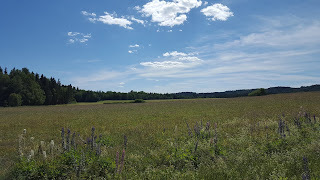 Not wanting to backtrack, and having a rough idea of where I was (closer to the highway than the lumber road), I decided to just hike south where I knew I'd eventually run into highway 166, and could (and did) get back on track again. 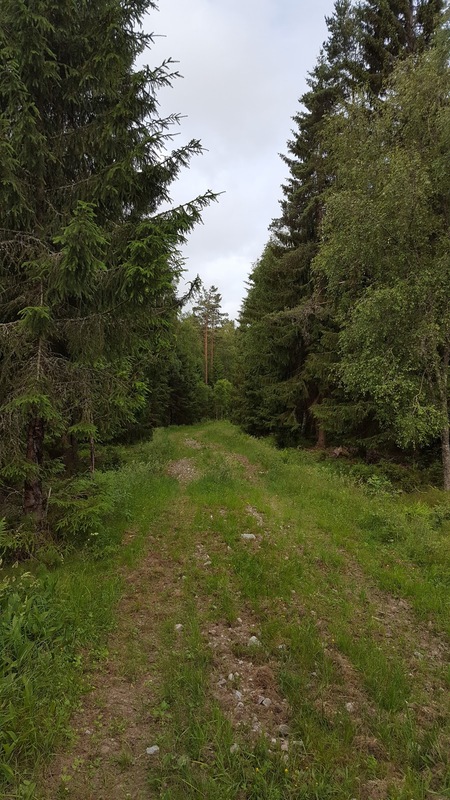 So if you find yourself lost in this area, remember that you can always either bushwhack south to the highway, or backtrack the way you came and give this mysterious old lumber road another go. 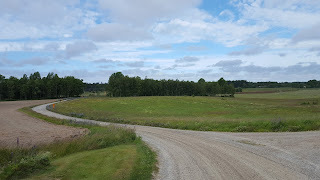 The rough endpoints of this road on the east and west sides respectively are: the entrance northwest of the Kroken hamlet, and the entrance northeast of the Bjällhögen farm. Close to the Bjällhögen farm to the southwest is a grassy dirt road that will then take you yet another gravel lumber road that goes north. It was getting late for me at this point, so shortly after I headed north here I camped out close to the southern end of lake Vartetjärnet. 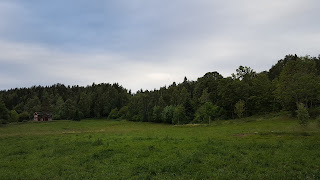 There is a stream flowing out of the lake around there that I filled up my water bottles with, or you could fill up directly at the lake, though be warned that this lake's edges are boggy in most places (hence why I filled up at the stream). 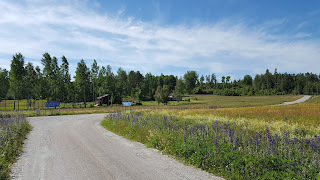 Continue on the lumber road going northwest and you will eventually come to a farm called Fagerhult. Here there is a faint dirt road that runs west into the woods and then ends in a clearing. Some bushwhacking is required here, but it's short, and once you are past the clearing and in the woods again it's fairly easy and even quite scenic. 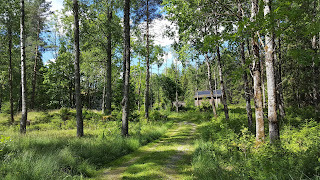 On the other side of the clearing in the woods there are some animal trails and a patch of pine woods that is open and easy to navigate through. Just keep going west, and of course avoid the bogs to the north. 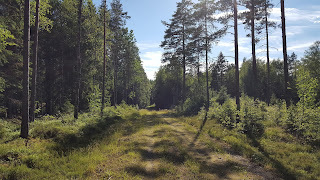 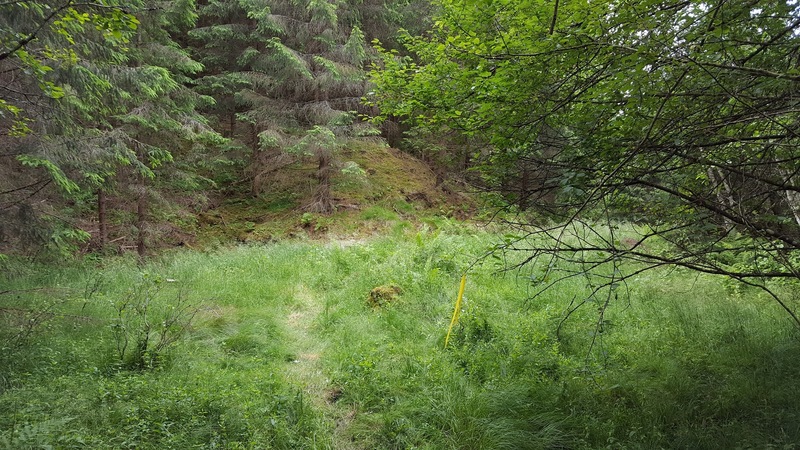 To my surprise, there were once again more dirt roads in the woods shortly after passing the bogs that were not on my maps. I followed one west, which ended in a dead end soon after, so I went back and followed the one that went roughly north by northwest. 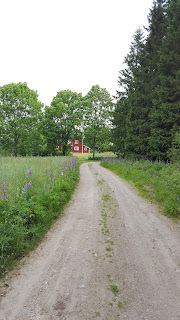 This ghost road eventually turned west and intersected with the road I was aiming for on my map in the first place, which took me west to the Rinnen farm house. Moving on west by northwest on a gravel road, you're now quite close to the town of Ed. The gravel road passes over the major train tracks (don't hike on these tracks! 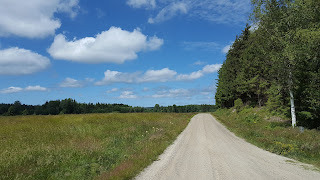 ), then to highway 166. 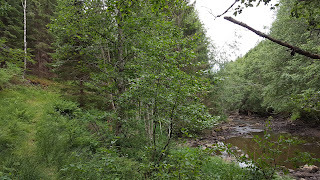 You could just follow the highway straight into the center of town as the most direct route, but there is one last bit of good hiking to be had if you are up for another minor challenge, which is a bit more bushwhacking and crossing a river. 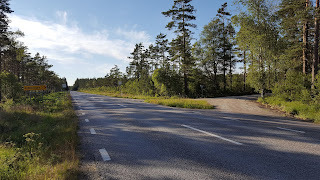 On the other side of the highway is yet another road that you can follow northwest. 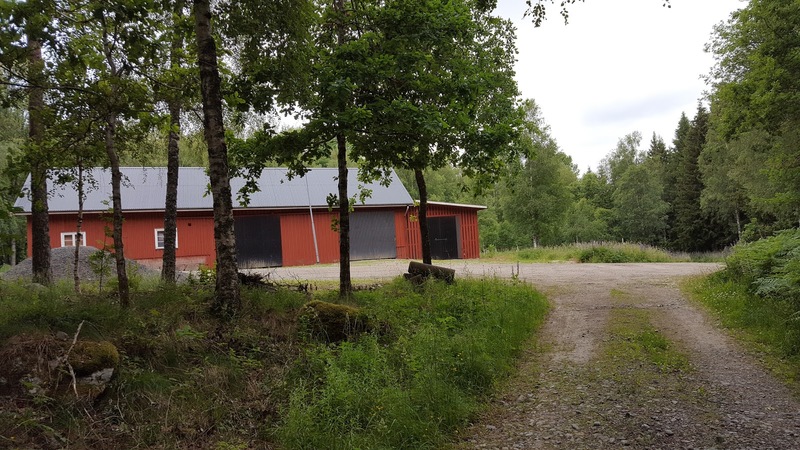 Then turn southwest on a gravel road past a farm and then back into the woods, close to the river Örekilsälven. 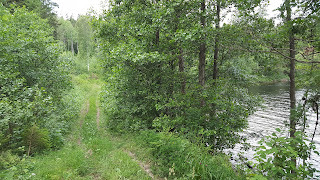 On the map there is supposedly a bridge over the river, but I didn't see it; but then again, I wasn't really looking for it, because I wanted to hike right down the middle of the river. 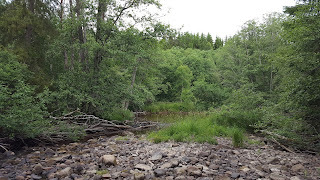 I noticed that the river was low, and I enjoy a nice river hike, so I followed the river until I couldn't anymore, then crossed it and soon found a marked trail. 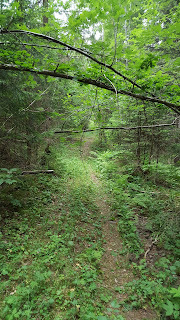 This trail along with the river walk was a wonderful last leg of the DCR. The trail soon meets up with a road, which you can follow west and then north on yet another road, and then it's a straight shot to Ed. 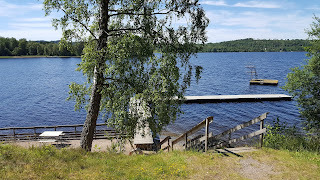 Along the way, if you want to take another swim, you can do so at several spots at lake Lilla Le. When I got into the center of town I of course ate my obligatory falafel and drank a beer to celebrate, then went to the tourist center to see if they had any useful information on the trails and backwoods roads in the area I just hiked. 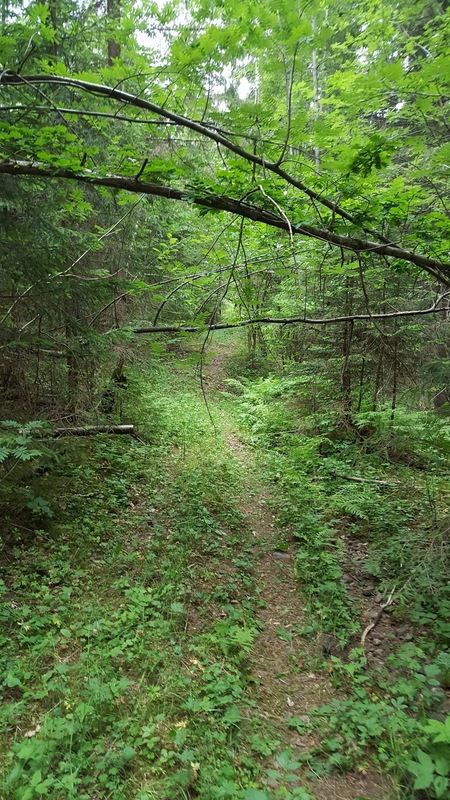 Sure enough, a local working there knew the woods in the area well and has hiked them many times, and he confirmed that the maps indeed don't match the reality of the network of trails, paths, and roads in the woods. 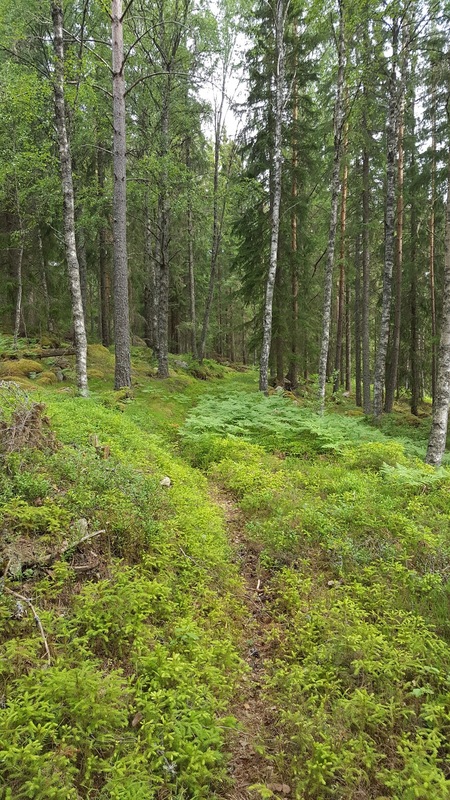 And he agreed that it's a beautiful area worth hiking. 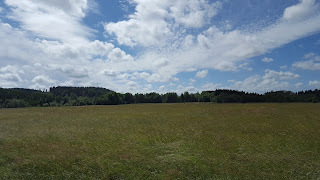 Hopefully others will be able to discover the DCR and enjoy this beauty too. That wraps up another trail guide. 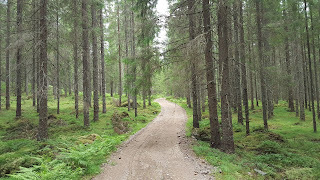 As always, please feel free to ask questions or give feedback on this trail guide, either here in the comments below, or on my blog's Facebook page. I am especially interested in anyone that will hike this route and/or The Ed Loop! 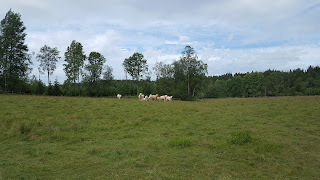 They are my creations, after all, so of course I want to continue to promote and improve them.